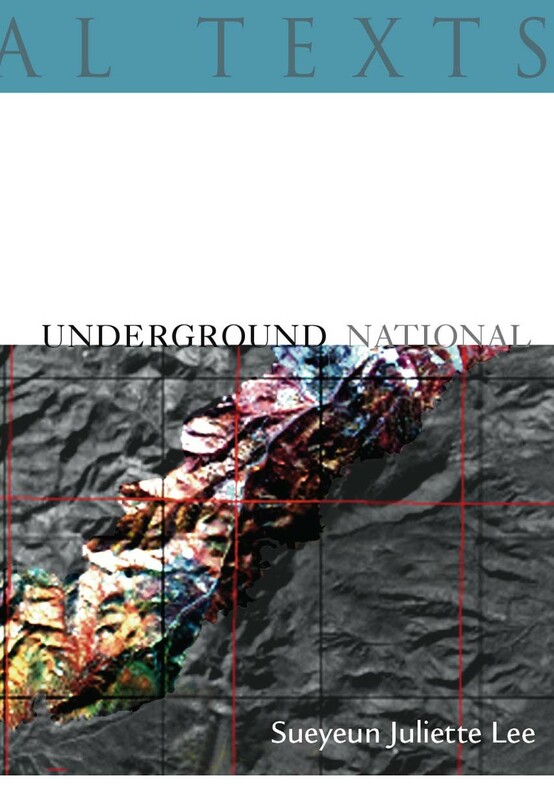 Sueyeun Juliette Lee titles the first section of Underground National with an answer that inverts, re-contextualizes and re-defines the Double Jeopardy question: “Korea, What is.” Each page flips like one of Alex Trebek’s blue television screens, revealing answers in the form of satellite images, sound bytes and “ShareThis RSS.” “An impossibility” for 200 may be Lee’s first category and line, but the multiple stains, burials and explosions that gather resonance and color locate a nation—a nationalism—in jeopardy. But what the nation speaks, we are required to understand. And that speaking ties us to this sinking ground. And it isn’t stone at all, but made of blood. Just as I am, just as you are (53). And what is enough distance to see. Outside of a nation being _____, _____, and _____. The subtleties of your be(long)ing as the outline of metaphor. Between and among these gestures, Lee periodically returns to an image of a kite. Its symbolic suspension and tension brings us out of the earth and into the sky, connects underground and outer space, links source text to memory and manifests in the body of the one who flies it: “Kite: between two impossible states. A tug and pull enforced by sky’s restless dreaming, contrary wakefulness of earth, nerve-like. Flicker feeling in the flesh, cast free but held” (19). Resonances with Myung Mi Kim’s Commons and Theresa Hak Kyung Cha’s Dictee float up out of the rubble of this text, touching upon a Korean American feminist relationship to national longing and national strife. Lee writes the kite as the texture of a body going “there”/”home,” which gains distance and perspective in spite of the vulnerability of its fabric. It is, in the same moment, buffeted and tethered, in fetters, and yet also in danger of “fall[ing] from out of the sky” without warning (90). In the remarkable section, “THE BENEFIT OF HAVING A HUMAN BODY,” the tone shifts to prose and part mythic dreamscape. Here, Lee focuses on the body’s experience of nation-building and nation-collapse. Lines like “Grant him a visa, he who eats with a spoon, document a tattered list of names” (17), “I help by explaining a Medicaid letter to her” (87) and “Should I emigrate if the opportunity arises” (90) point to stories of immigration and other arrivals as they play out in intergenerational relationships. Lee writes the body arrested in transit between several nations and ideas of nations: “I see that there are mirrors that stand between us and the lands we claim as home” (92) and “I hallucinate this landscape, and am myself a mirage” (93). The body “emerges and drops,” looking for a place to land, looking for a place to hide. And inevitably, regardless arrival, regardless the many small and difficult decisions, compromises, and sacrifices that lead a body or its spirit there, it is never what it seemed to be. That quality of air you brace yourself for, that headlong into another ocean’s wrap, a new sound’s spray, out of it you emerge and drop. How does it dissolve, shutting past? The seams that hold things together also keep them at bay, just like the body is a barrier and embrace. I mention these things to you very softly, and only when I think you are asleep. And the expression of them, is that so meaningful, and what (95). * Formatting for some of these quotes appears differently due to blog constraints.